Welcome to the first installment of the Girardian Virtual Bible Study. You can join Lindsey and Adam on the live Bible Study with your comments and questions on the Raven Foundation Facebook page every Wednesday morning at 10:00 am Central, 8:00 am Pacific. If you can’t make the live show, you can watch the recording or listen to the MP3 the following day here on the Raven Review. For more on the workd of René Girard and the Bible, we highly recommend Paul Nuechterlein’s website Girardian Reflections on the Lectionary. 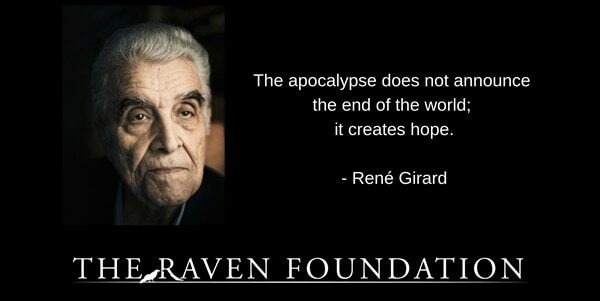 If it is apocalyptic, it inspires hope. If it doesn’t inspire hope, it’s not apocalyptic. But who does Apocalypse give hope to? Many claim the apocalypse gives hope only to a small number of people called “God’s elect.” For everyone else, apocalypse means utter destruction and damnation. This notion is false. Apocalypse is an essential aspect of the Good News. And the Good News is for everyone. … as a Savior He sent Him, and as seeking to persuade, not compel us; for violence has no place in the character of God. As calling us He sent Him, not as vengefully pursuing us; as loving us He sent Him, not as judging us. Girard’s insistence that violence has no place in God is nothing new. The ancient Christians understood this apocalyptic revelation, too. How is this Good News? Because apocalypse does not bury our heads in the sand when it comes to violence. Rather, it names violence for what it is – the human problem that could destroy our world. While seemingly dire, the only way we can solve the problem is by naming it and accepting this truth. Only then can we be responsible for changing the way we act in the world – from violence to nonviolent love. I think of hope and optimism in terms of time. Optimism lives in a moment that can be fleeting or ignited by events we experience temporally. Hope lives on its own time where the culmination of all things has been already revealed by the work of God in restoration and new life. Hope is already, optimism may works as the not yet. Both live in the same moment. That is helpful, Jeff. I hadn’t quite thought of hope and optimism like that, but I like it!